” You were referred through a friend who passed with you, at first I found the lessons a bit more difficult than I thought they would be. But you were really thorough and ran through everything very clearly, which was much better than my previous instructor. 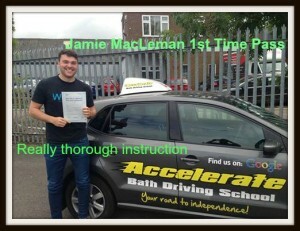 You helped me pass first time, I would definitely recommend you Jamie”. 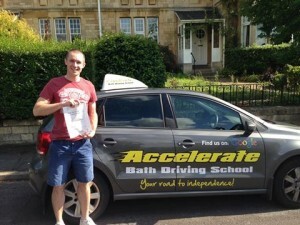 ” I would like to thanks Aaron my driving instructor, I got everything out of my driving lessons and passed first time. I now feel I am a safe and confident driver, I thought your teaching methods were very good. Because you were very friendly, you made me feel very relaxed on my driving lessons. I will recommend you to all my friends, thanks again Nick”. 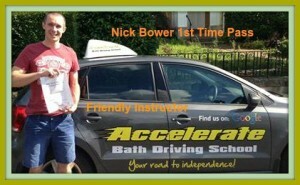 Congratulations to Nick Bower of Bath who passed his practical driving test 1st time at Kingswood test centre in Bristol on the 22/07/15. 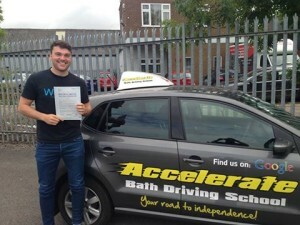 All the best in the future with your new job and new baby, from Aaron your driving instructor at Accelerate Bath Driving School. Well done to Jamie MacLeman of Bath who passed his practical driving test 1st time at Brislington test centre in Bristol on the 24th/07/15, Jamie drove really well and pasted with just 4 minor faults. Good luck with your new job and your move to Berlin, all the best from Aaron your driving instructor at Accelerate Bath Driving School.